US Dept of Education | VAMboozled! Last week, a technical report that one of my current and one of my former doctoral students helped me to research and write, was published by the University of Colorado Boulder’s National Education Policy Center (NEPC). 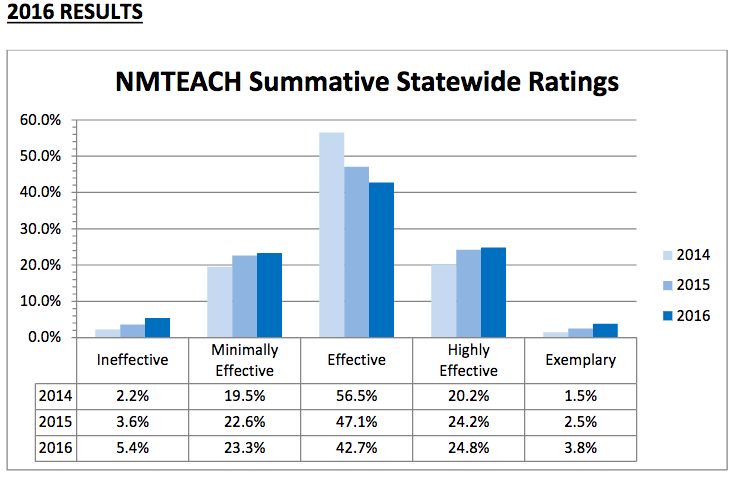 While you can navigate to and read the press release here, as well as download and read the full report here, I thought I would summarize the report’s most interesting facts in this post, for the readers/followers of this blog who are likely more interested in the findings pertaining to states’ revised teacher evaluation systems, post the federal passage of the Every Student Succeeds Act (ESSA). 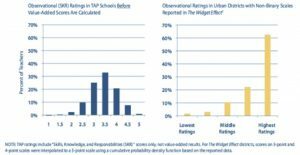 — First, the role of growth or value-added models (VAMs) for teacher evaluation purposes is declining. That is, the number of states using statewide growth models or VAMs has decreased from 42% to 30% since 2014. This is certainly a step in the “right,” defined as research-informed, direction. See also Figure 1 below (Close, Amrein-Beardsley, & Collins, 2018, p. 13). — Second, because ESSA loosened federal control of teacher evaluation, many states no longer have a one-size-fits-all teacher evaluation system. This is allowing local districts to make more choices about models, implementation, execution, and the like, in the contexts of the schools and communities in which schools exist. — Third, the rhetoric surrounding teacher evaluation has changed: language about holding teachers accountable for their value-added effects, or lack thereof, is much less evident in post-ESSA plans. Rather, new plans make note of providing data to teachers as a means of supporting professional development and improvement, essentially shifting the purpose of the evaluation system away from summative and toward formative use. Take advantage of decreased federal control by formulating revised assessment policies informed by the viewpoints of as many stakeholders as feasible. Such informed revision can help remedy earlier weaknesses, promote effective implementation, stress correct interpretation, and yield formative information. Ensure that teacher evaluation systems rely on a balanced system of multiple measures, without disproportionate weight assigned to any one measure as allegedly “superior” than any other. If measures contradict one another, however, output from all measures should be interpreted judiciously. Emphasize data useful as formative feedback in state systems, so that specific weaknesses in student learning can be identified, targeted and used to inform teachers’ professional development. Mandate ongoing research and evaluation of state assessment systems and ensure that adequate resources are provided to support [ongoing] evaluation [efforts]. Set goals for reducing proficiency gaps and outline procedures for developing strategies to effectively reduce gaps once they have been identified. We hope this information helps, especially the states and districts still looking to other states to see what is trending. While we note in the title of this blog post as well as the title of the full report that all of this represents “some steps in the right direction,” there is still much work to be done. This is especially true in states, for example like New Mexico (see my most recent post about the ongoing lawsuit in this state here) and other states which have yet to give up on the false promises and limited research of such educational policies established almost one decade ago (e.g., Race to the Top; Duncan, 2009).